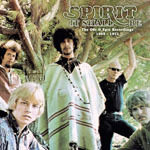 Share the post "Album review: SPIRIT – It Shall Be (The Ode & Epic Recordings 1968-1972)"
Life is not fair. Were it to be, this 60′s US outfit would be up there along with the much-feted likes of fellow West Coast time-liners, Love. Yes, ‘Forever Changes’ is a wonderful album; in this its 50th anniversary year, it’s been re-issued all over again, and in every conceivable format, but nary a new word can be said of it these days because it’s been said – and many times over. There have been Best Of’s over the ensuing years, but in relative terms of championing, ‘It Shall Be’ is really just the start for Spirit. Formed in Los Angeles in 1967, the five-piece recorded, over the same number of years, four eclectic releases honeying rock, jazz, blues and psychedelic stylings within singular and melodic compositions, from brass-fuelled rock workouts to elegiac string instrumentals, honed by the production talents of the likes of Lou Adler and David Briggs. Vocalist Jay Ferguson and guitarist and former-Hendrix sideman Randy California’s fronted proceedings with band ‘dad’ drummer Ed Cassidy (California’s stepfather), keyboardist John Locke and bassist Mark Andes injecting just the right mix of deft and heft (along with terrific harmonising). All punched well above their weight, evidenced on this 5CD box set that takes in early 1968′s pop/jazz/psych/strings S/T debut followed by more rock-infused releases in ‘Clear’ (including elegant instrumentals composed for Jacques Demy’s locally-shot film, Model Shop), ‘The Family That Plays Together’ (yielding ear-worm hit single, ‘I Got A Line on You’), dreamy career-high concept album, ‘The Twelve Dreams of Dr Sardonicus’ (ironically, the band falling apart), concluding with atypical boogying ‘Feedback’, recorded by Cassidy and Locke with Texans John and Al Staehely, the latter’s drawling vocal bringing something of the south to the west to the final item. Sony pushed out a mid-priced box of these some years back but ‘It Shall Be’ is a step up with a disc and a half’s worth of bonus material including the Model Shop soundtrack, the mono mix of the debut, the original stereo mix of ‘The Family That Plays Together’, associated out-takes, singles and alternate mixes. Many ramp up the songs even further, while the jazzy extras are sheer balm. The background to these treats is related in an illustrated booklet that draws heavily on archival interviews, surviving band members Andes and Ferguson absent, seemingly reserved about sharing their collective past. Time then, for the music monthlies to call them up and run Spirit up the flagpole for a much-deserved salute. For now, this definitive curation of their fizzing talent elevates its members to their rightful places in the canons of West Coast music history: five stars. This entry was posted in ALBUM REVIEWS, ALBUM REVIEWS (Mobile), All Posts, Reissues and tagged album, blues, classic rock, Ed Cassidy, fusion, It Shall Be (The Ode & Epic Recordings 1968-1972), Jay Ferguson, Mark Andes, psychedelic, Randy California, review, Spirit, West Coast. Bookmark the permalink.